Yes, it IS possible to have a rustic wedding without mason jars — trust us. 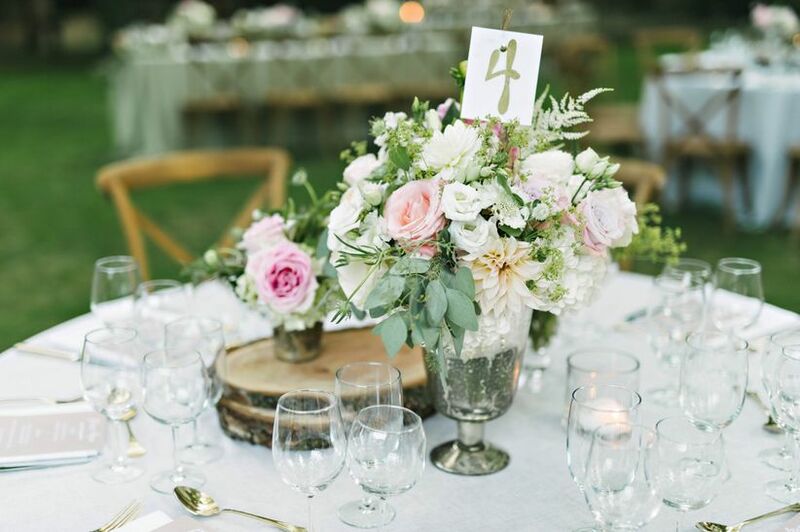 Say hello to these stylish rustic wedding centerpieces that are anything but overdone. 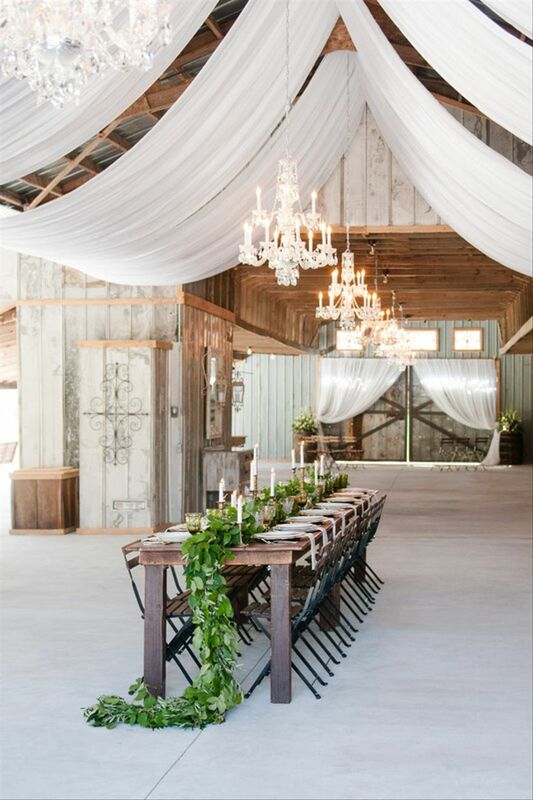 At the height of the barn wedding craze, it was rare to find any rustic wedding centerpieces that didn't include at least one mason jar, let alone dozens of them. 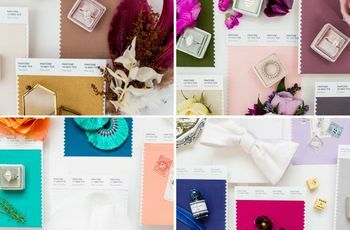 But now that this decorative accent has seen more than its fair share of the spotlight, couples have started branching out and dreaming up unique rustic wedding ideas that don't include a single mason jar, and we are totally on board! From simple greenery garlands to assorted logs that are surprisingly stylish, we're sharing some of our favorite ways to decorate your rustic tablescape without a mason jar in sight. Take a look at these 14 creative rustic wedding centerpieces. Vintage-style hurricane lanterns and votive candles give your wedding tablescape an inviting farmhouse vibe. 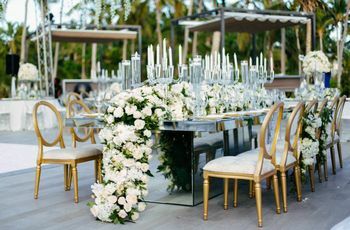 Greenery and oversized blooms, like dahlias, bring a fresh element to the table without being distracting or overbearing. 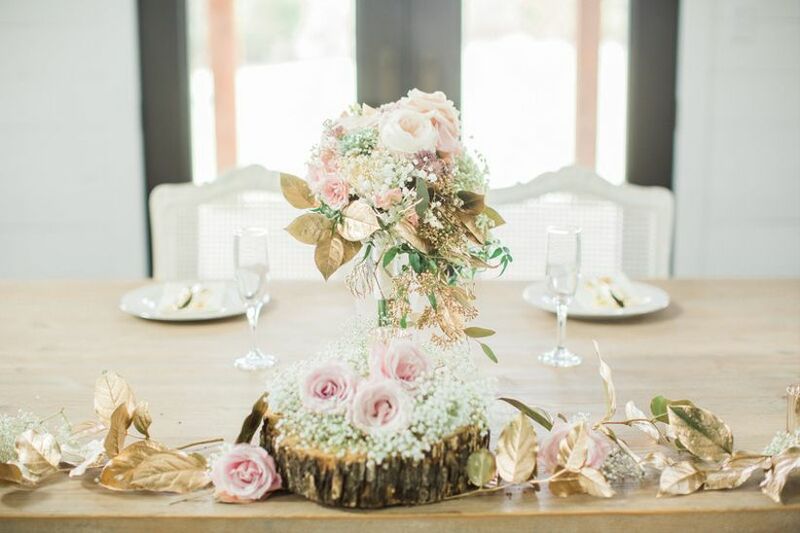 How perfect would this blush and gold setup be for a shabby chic wedding? The painted leaves are easy to replicate as a finishing touch, but they make all the difference! A cobalt blue and green color palette feels outdoorsy and pastoral when paired with wooden elements, gold details and crisp white flowers. 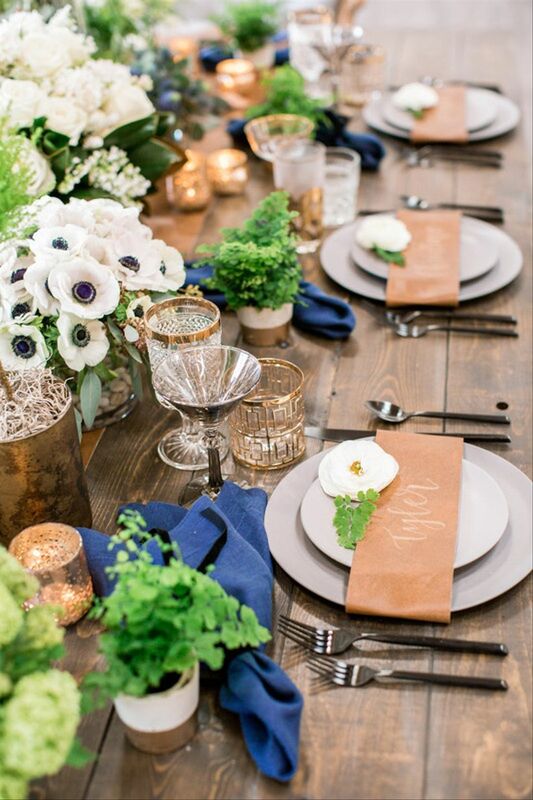 This look is perfect for the couple who wants a subtle rustic feel that's also a little bit classic. 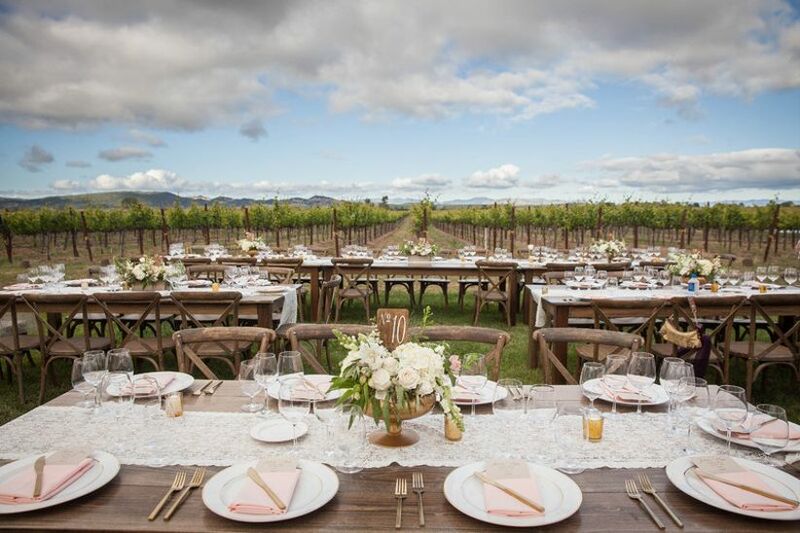 This rustic chic centerpiece would be fitting for anyone getting married at a vineyard. 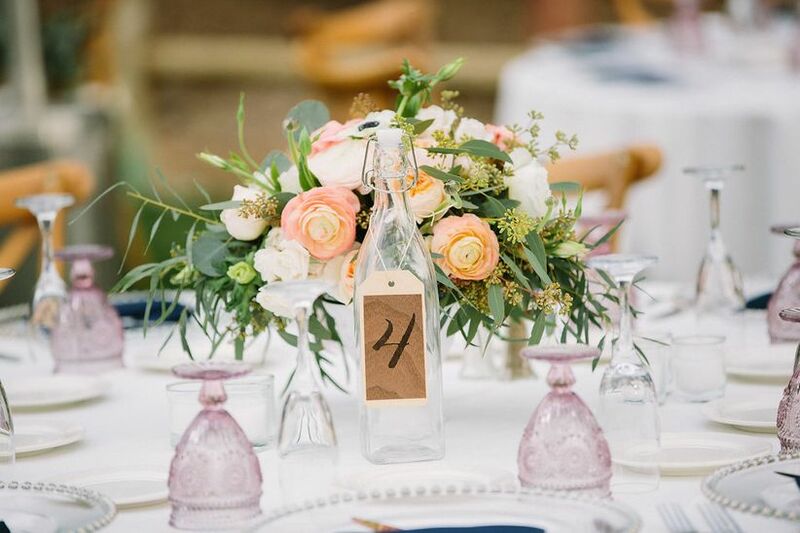 Use empty latch-top bottles to display your table numbers for a laid-back yet stylish effect. 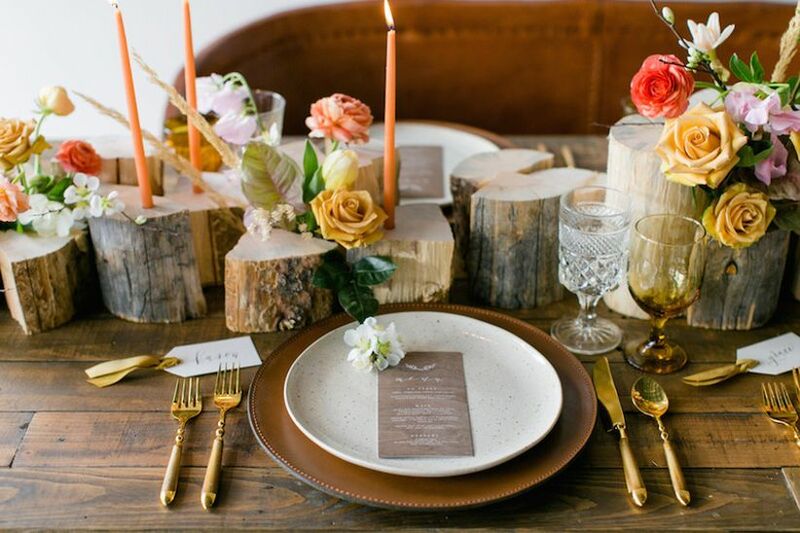 If you're having long banquet tables, create a unique centerpiece by using logs and wooden slices in assorted heights. We're loving the mismatched look of this cool three-dimensional setup! Add taper candles and flowers to incorporate a dose of color, and don't worry about the finished product being completely perfect. Burlap table runners are a rustic wedding staple, but they're not the only option. 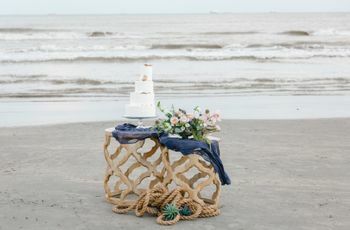 A lace runner is elegant while creating a vintage-inspired look that you can accent with rustic pieces, like dark wood tables, cross-back chairs and brass flatware. If you're dreaming of a farm-to-table rustic wedding, skip the usual floral centerpieces and use produce to decorate your tables instead! 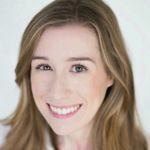 This idea is creative and eco-friendly, and we're betting that your guests haven't seen anything like it before. Mix in a few wildflowers and herbs for the finished look. Long, flowing runners are the modern way to do wedding table linens. 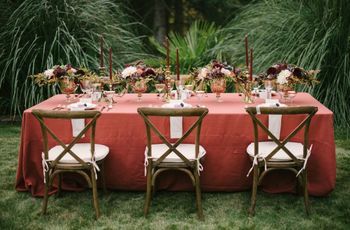 For a country chic aesthetic, skip the tablecloth to show off a weathered wood table and accent it with a soft runner, oversized centerpiece and slotted chairs. A pitcher of Southern-style lemonade doesn't hurt, either! Sometimes, less really is more! 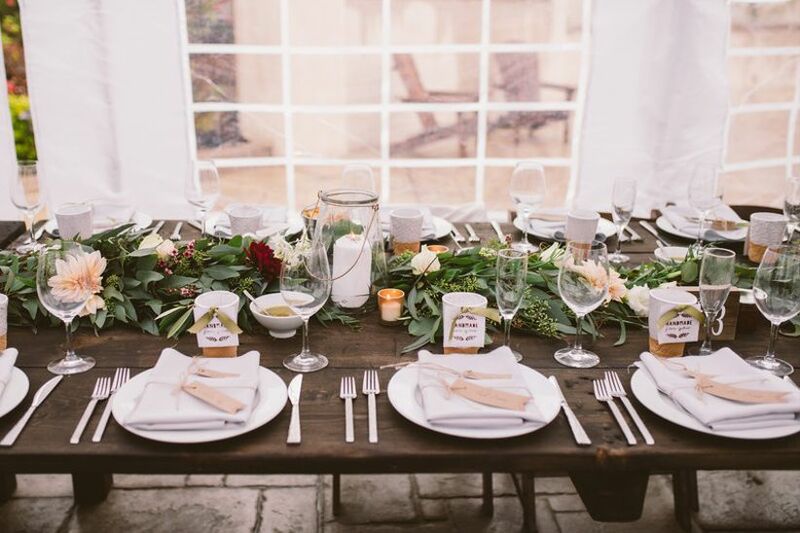 This simple tablescape featuring a long greenery garland is effortlessly romantic for a rustic wedding. The key to nailing this type of centerpiece is to leave it intentionally "undone" with mismatched candles and no tablecloth. This trio of compote arrangements is stylish and classic with understated rustic vibes. 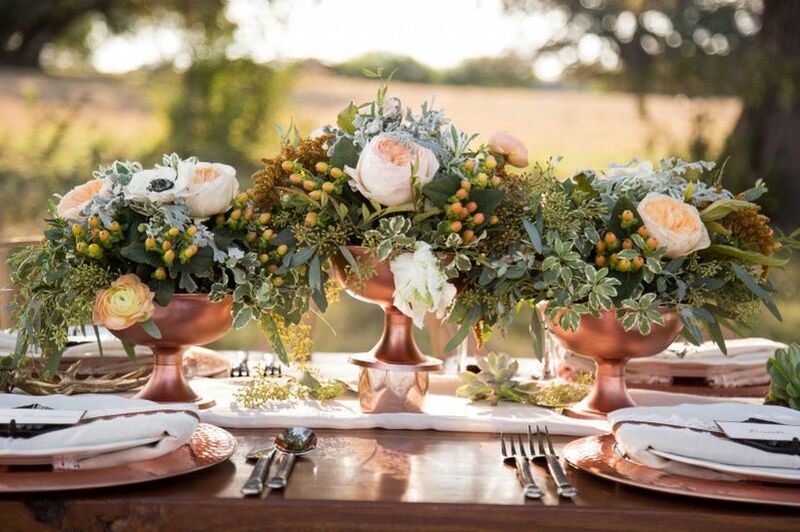 Instead of silver or gold, opt for copper vessels in your rustic wedding centerpieces to create a truly eye-catching effect. 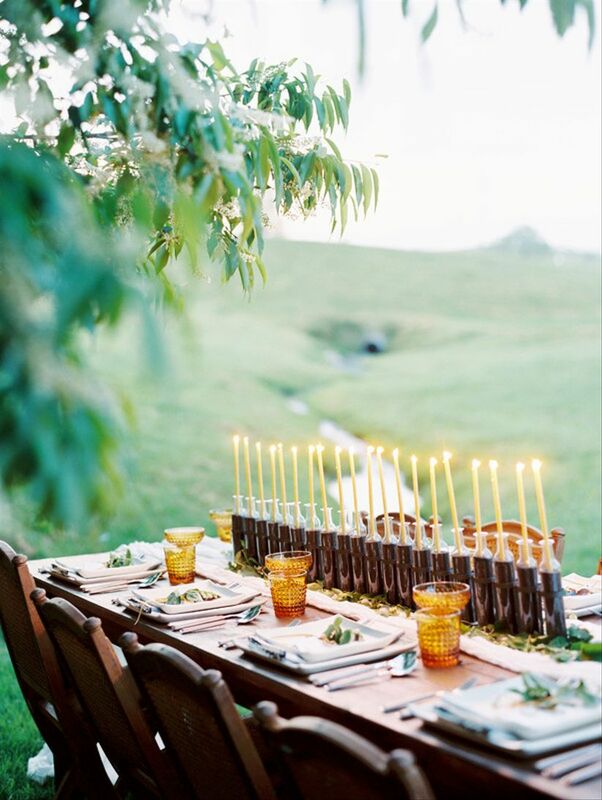 A row of taper candles is one of the most straightforward rustic wedding centerpieces we've seen, but we're crushing on this utilitarian-inspired design. Tie everything together by incorporating glassware or other accents in the same color as the candles you choose. These marigold yellow glasses contrast beautifully with the dark wood! 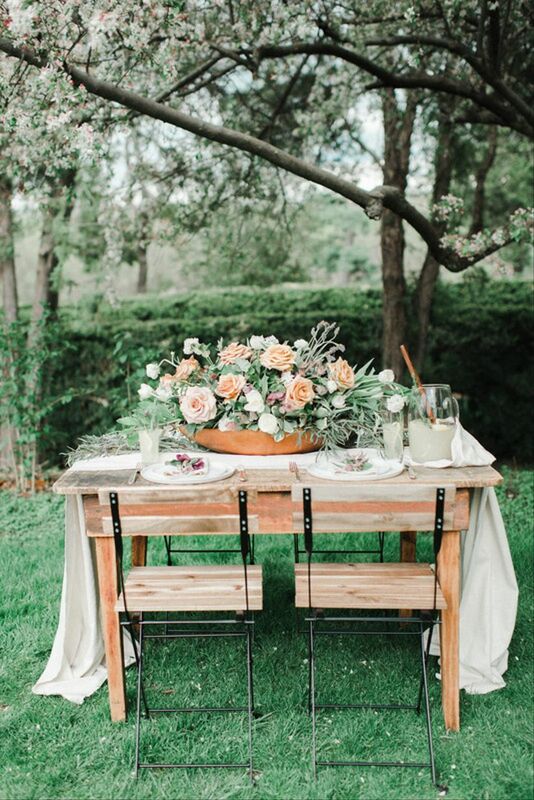 Swap glass or metal vessels for wooden troughs to instantly bring a rustic look to your wedding centerpieces. 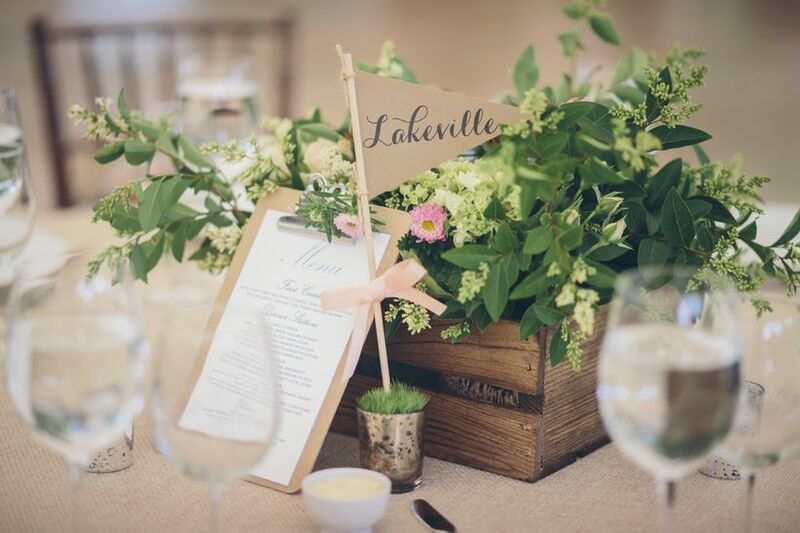 Table names written on miniature pennant flags are a cute, playful addition. 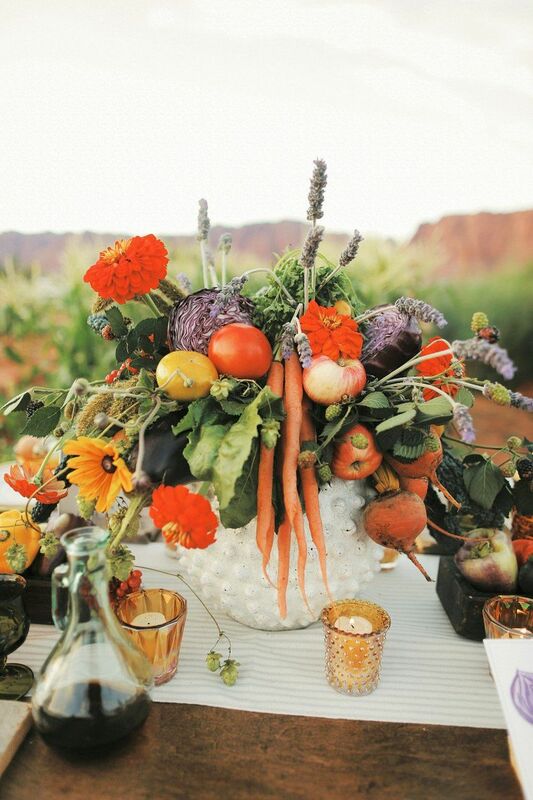 Behold: our favorite rustic wedding centerpiece for fall couples. 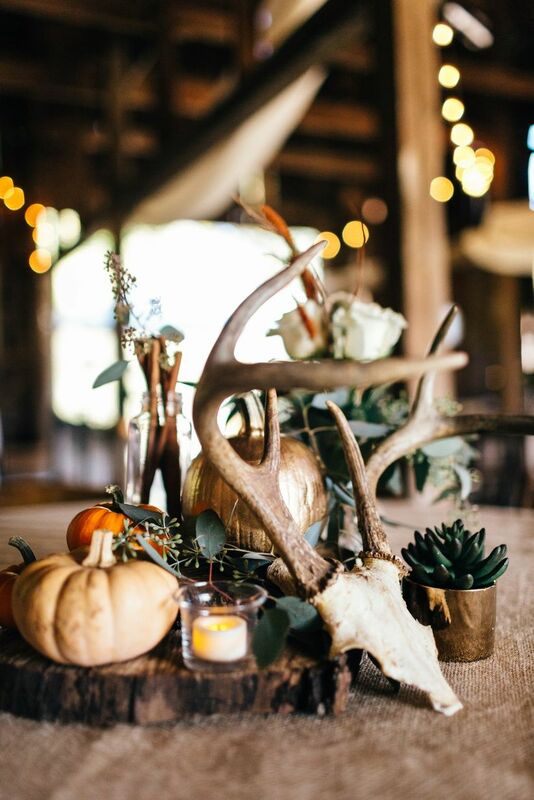 A collection of antlers, miniature pumpkins and succulents is boho-meets-rustic. The best part about using collected objects is that each centerpiece will be one of a kind!